Clone the repository, if you haven’t done it yet. Command --save will automatically write it in package.json. It’s a good practice to use it, because sometimes a programmer forgets to add the dependency and to push it to the server. The code won’t work as a result. You should add node_modules directory to the git ignore file, because they’ll be installed on the server automatically by SashiDo. Let’s create a new file which will keep our test code: twilio.js in the cloud directory. Don’t forget to require it in main.js, otherwise it’ll not work. 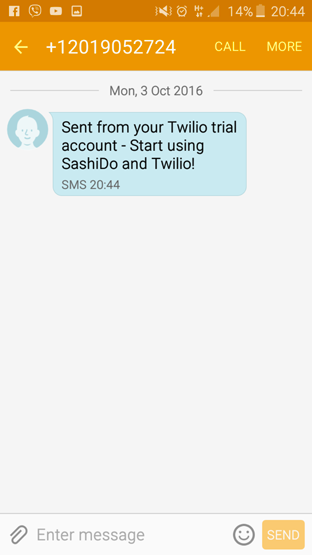 Let’s write a simple function in twilio.js, which will send a SMS to a number by your choice. **Now you can smoothly enjoy building complex apps with the power, given by SashiDo and Advanced Cloud Code. ** If you have any difficulties or need help - reach us at support@sashido.io .